As suspected, the Stanley Visitor Center in “downtown Stanley” is closed for the season. I ask one of Stanley’s 63 residents, a handsome man next door doing some carpentry, if he knows of any campgrounds in the area that are still open. 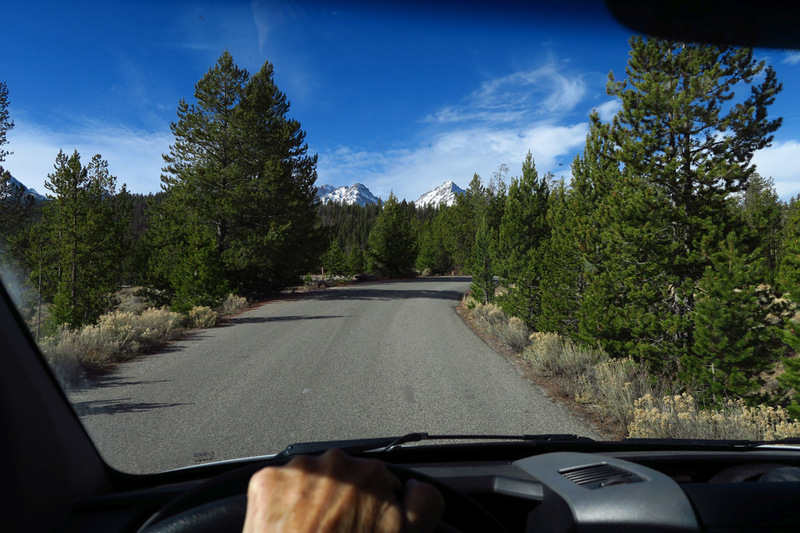 He directs me down about a mile out of town to the lovely Stanley Ranger Station for the Sawtooth National Recreation Area. Much to my relief, the Ranger explains that are several campgrounds still open. 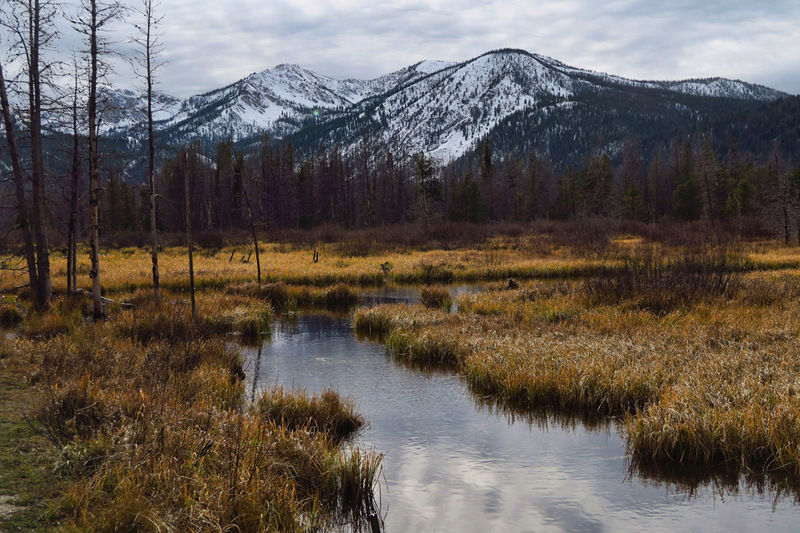 They seem to leave one open per location until winter, so there is one at Stanley Lake, Petit Lake, Alturas Lake, and one along the river. 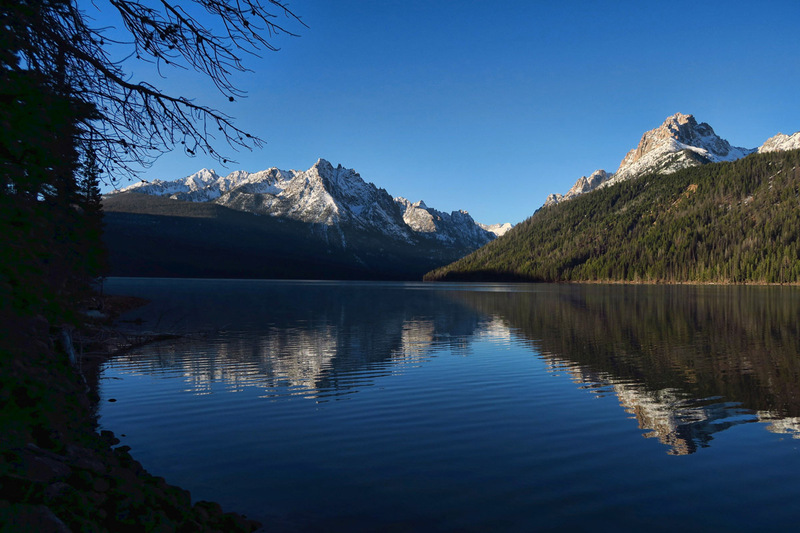 I tell her I have my heart set on Redfish Lake, so she recommends Sockeye Campground. 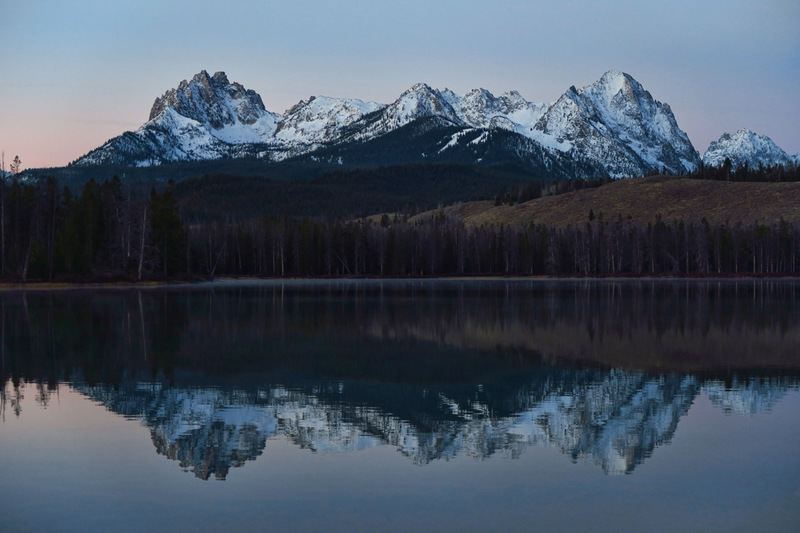 First views of the Sawtooth Skyline from downtown Stanley. 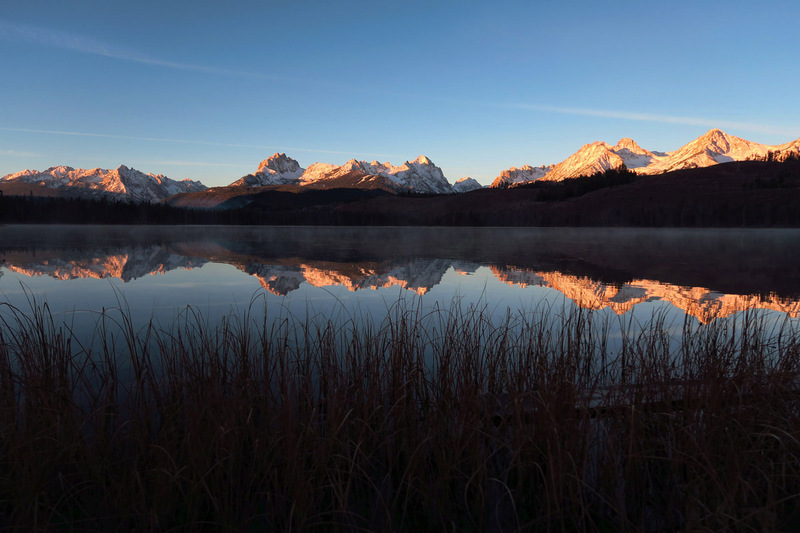 Both Redfish Lake and the Sockeye Campground are named for one of the longest fish migrations in North America. During migration, fish swim up to 900 miles upriver to spawn, producing what was once 45% of all the Chinook and Sockeye Salmon in the Columbia River basin. 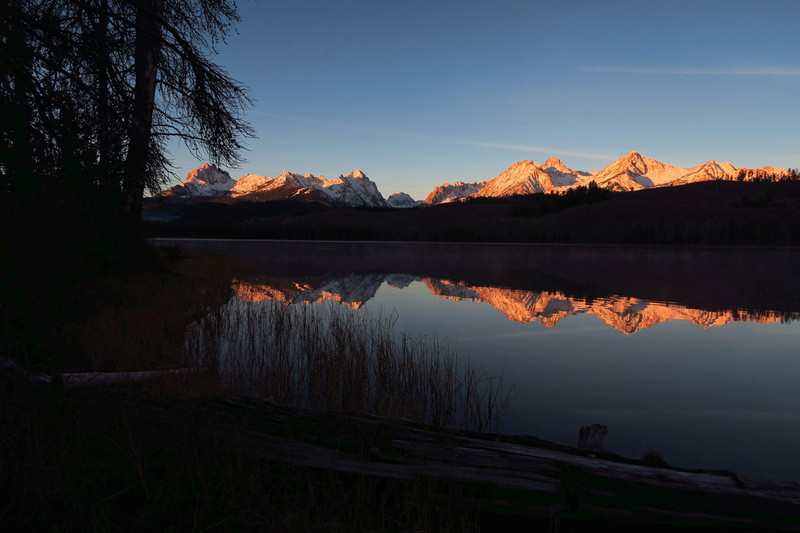 The lake is named for the salmon’s brilliant red color during spawning season. However, the number of wild sockeye has dwindled over the years. They are now protected under the Endangered Species Act, therefore must be released immediately if caught. Don and I use a set of walkie-talkies to communicate from rig to rig, so we make jokes as we circle through the Sockeye Campground about whether or not we will be able to find a spot….there is not another soul in the entire 23 site campground. We choose the two sites closest to the “Beach Trail,” or path down to the waters edge. 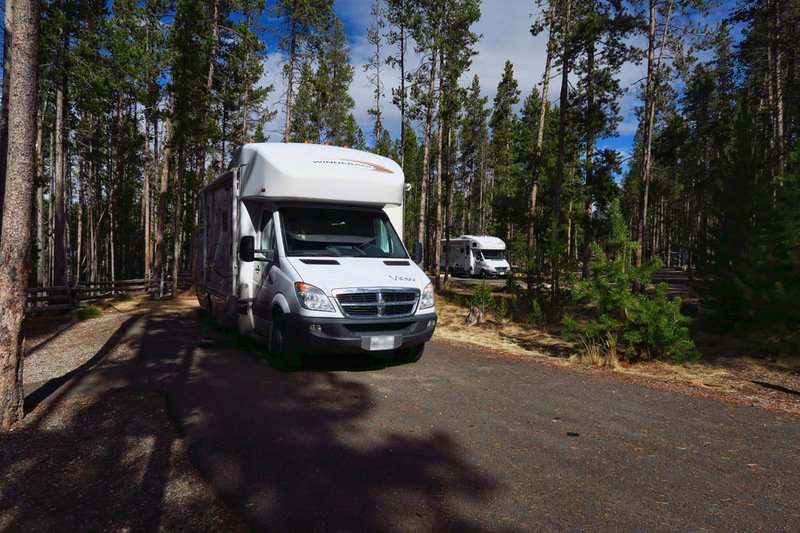 The Sockeye Campground is beautiful, with level, paved sites, many which overlook the lake. Given that the campground is over 6,500 ft elevation, it’s a relief to see there is no snow. 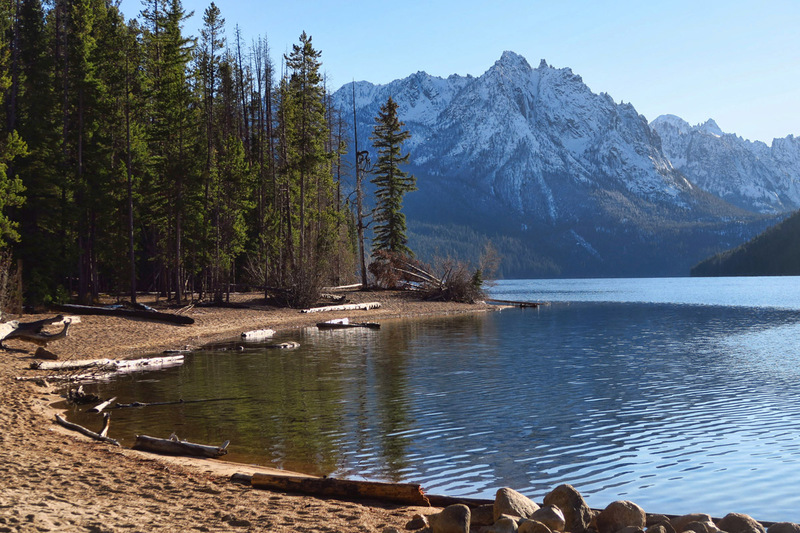 The campground is faced with the warming western afternoon sun, being on the eastern shore of Redfish Lake. Site Nbrs 14 and 15 in Sockeye Campground. Views from Site #6 are better because of fewer trees, but it’s a longer walk to the water’s edge. 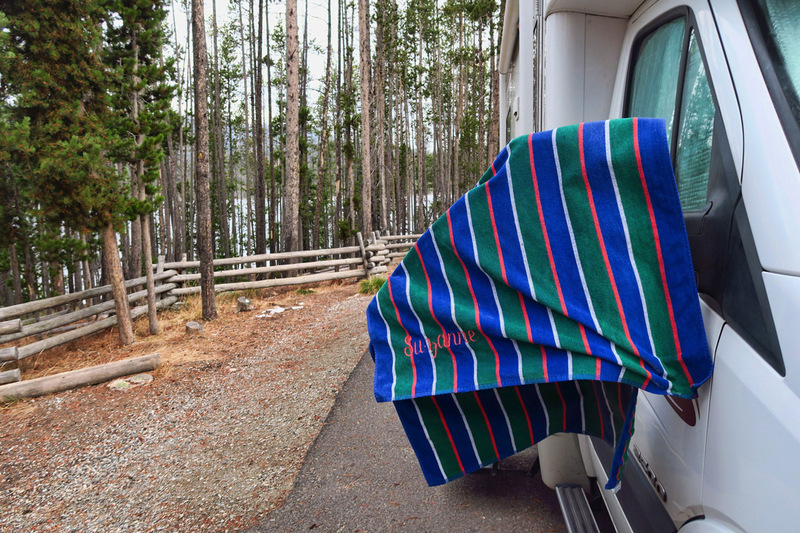 I hung my beachtowel, still wet from the Kirkham Hot Springs, on the fence overnight. It froze stiff! View from the “Beach Trail” near the end of Sockeye Campground. 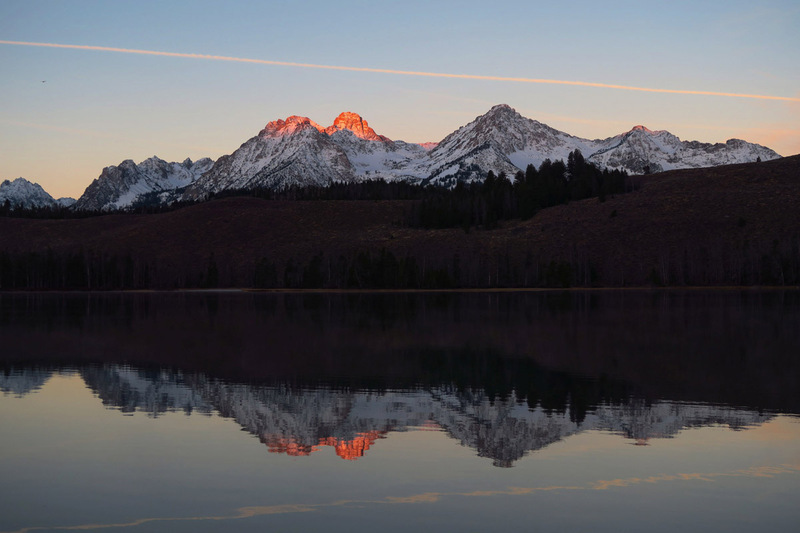 Having read Wheelingit Nina’s post this summer about getting up in the middle of the night to photograph the Sawtooth Range at sunrise, how could I resist the urge to do the same? 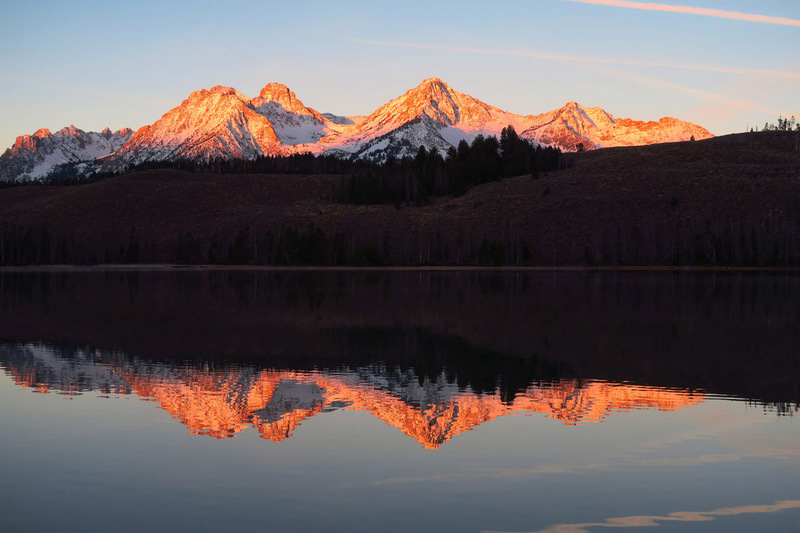 If Nina got up at 3:30am and drove from Ketchum over the Galena Summit just to see the mountains in their “alpenglow,” surely I could roll out of bed and walk down to the waters edge at 7:30am, as the sun does not rise until 8am this late in the year. Creek on the way to Stanley Lake. Easy to see why the “Road Closed” is up through the campground. 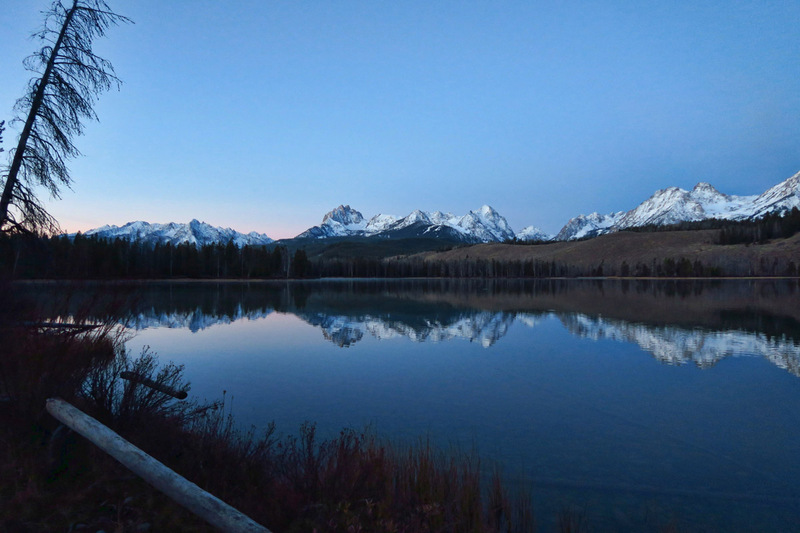 My first morning in the Sockeye Campground, I get up before daybreak. My outdoor thermometer indicates it’s 28 degrees outside, and 50 inside, which makes poking my feet out from under the covers almost unbearable. I put on two layers of everything, and head down the Beach Trail. But it becomes evident early on that the morning sunrise is going to offer nothing but disappointment where photography is concerned. The low cloud layer is beautiful floating across the still lake, but it makes for dismal photographs of a hazy shade of winter. 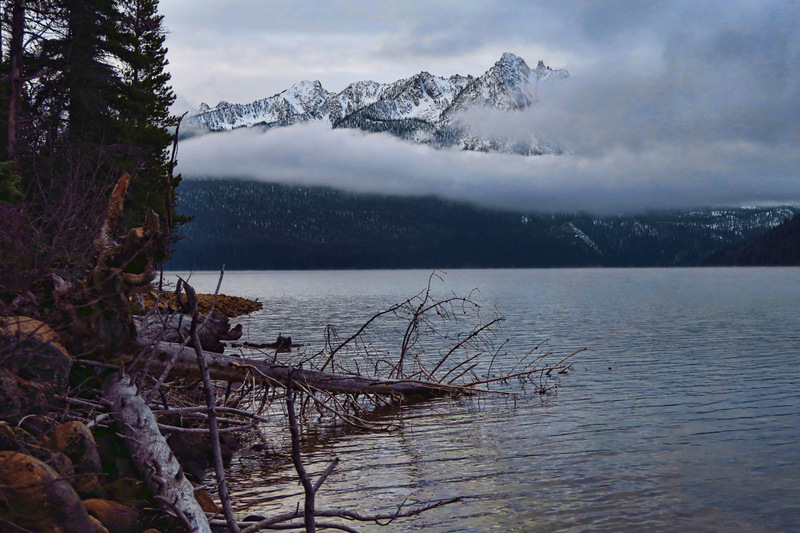 Still not a waste, as the sounds of the bird calls echoing across the lake interrupting the deafening silence, and occasional glimpses of the mountain peaks through the clouds is worthy of my effort. I take a few shots and head back to the Winnie to curl back up beneath my two layers of down. First early morning in Sockeye Campground looking very wintery! 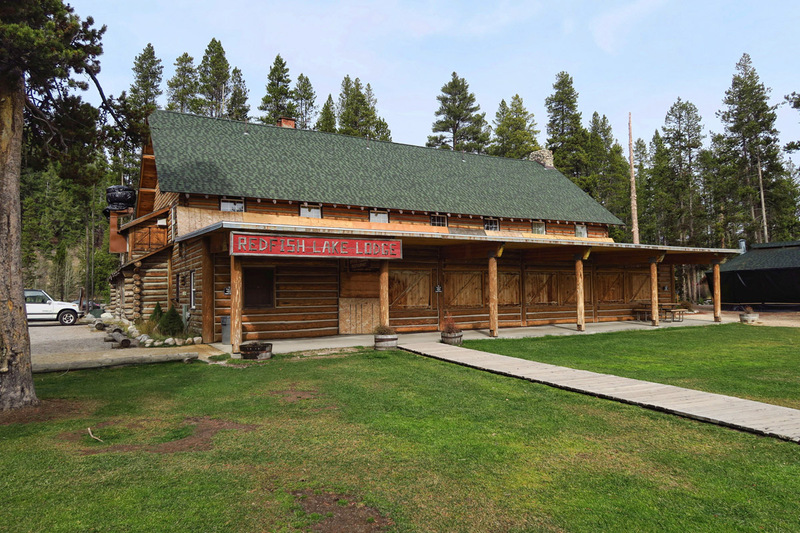 Rustic Redfish Lake Lodge, boarded up for the season. The second day, however, is a different story. I awake unprompted in the early morning hours and look out my Winnie window to see star-filled skies. I don’t wait for sunrise, but instead stumble out of bed into the stillness and dark, breathing in cold crisp air followed by billowing exhaust from my lungs. I want to try some night shots of the stars. Experimenting with night shots, I photograph Don’s Navion in the dark. This photo is blurred and crooked, but it was dark when I shot it. I had no idea I actually captured one of the “Dippers” until I looked at it on the laptop. 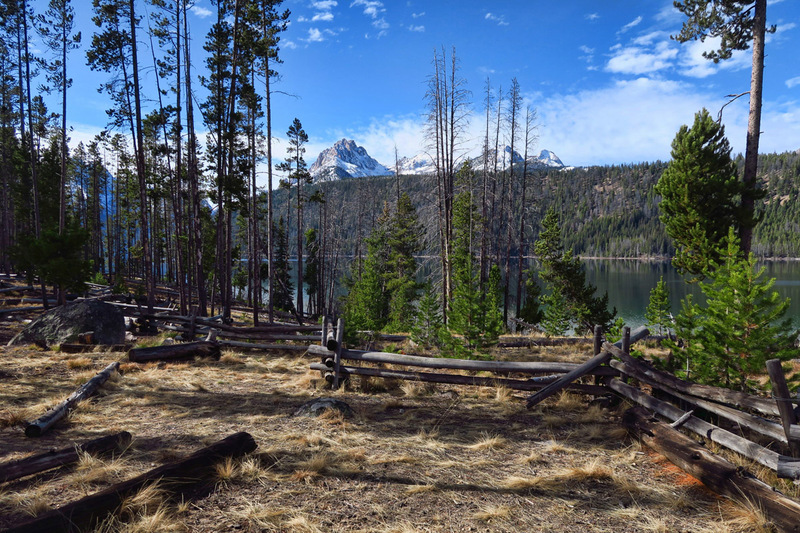 The skies are completely clear over the Sawtooths, so I leave Don a note telling him I am heading toward the Mountain View Campground on Little Redfish Lake. 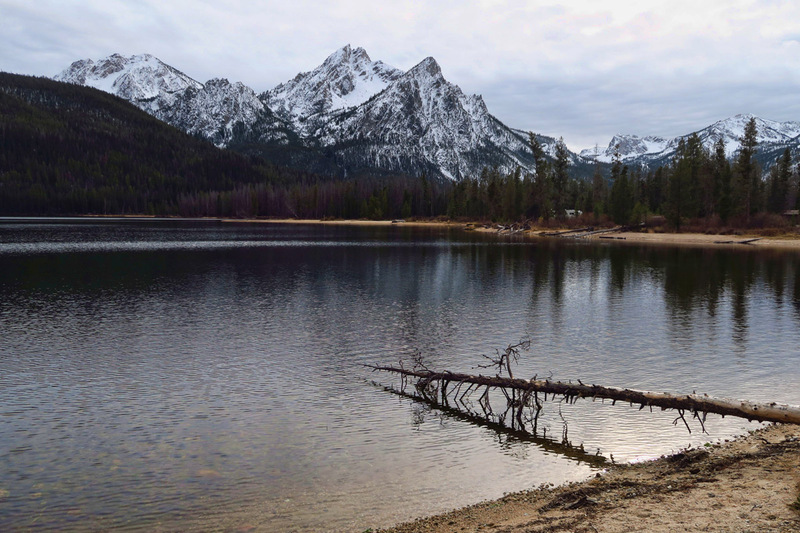 This was Nina’s recommendation for best place to photograph the entire Sawtooth skyline. 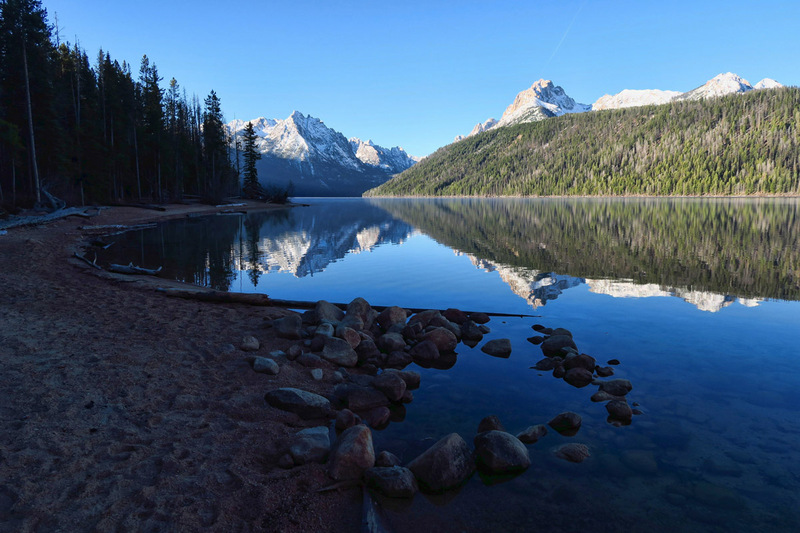 The little Mountain View campground is closed for the season, but being right alongside the road, it’s still possible to park and walk through the campground to the lake’s edge. I cheated off Nina’s homework to find the best location for capturing the entire range. I wish I had the words to adequately express the feelings of sitting on a log, all alone, apparently not another person within the sound of my voice. I watch the show unfold, first the lavender shades of the snow covering the deep purple mountains jutting up against the cobalt blue sky. 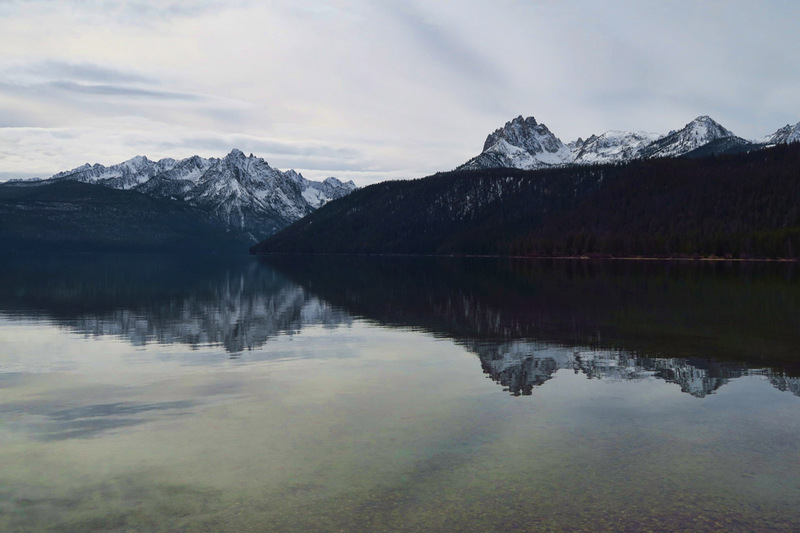 It’s so still, there is not a ripple on the surface of the Little Redfish Lake. Then, the sky lightens to a soft, pale blue as a warm glow appears over my shoulder. Finally, the first fluorescent orange shock of light punctuates the tallest peak, painting downward strokes until the entire mountain range is glowing. It’s as if the mountains are putting on a show, and I have the theater all to myself. I have given a lot of thought to this late season trip down through Idaho, the compromises that come with traveling during the “off season.” I seem to have moved from one extreme to the other…not being able to find campsites due to overcrowding on the coast to not being able to find campsites because they’re closed for the season. Somewhere in between lies the sweet spot of September. But of the extremes, which do I prefer? Definitely the off season, despite the trade-offs. Yes, it’s been cold. And there has been rain and even threats of snow. And it gets a bit frustrating finding out the places I planned to visit months ago closed the week before I got there. But if you look beyond the typical tourist attractions, the rewards are rich. 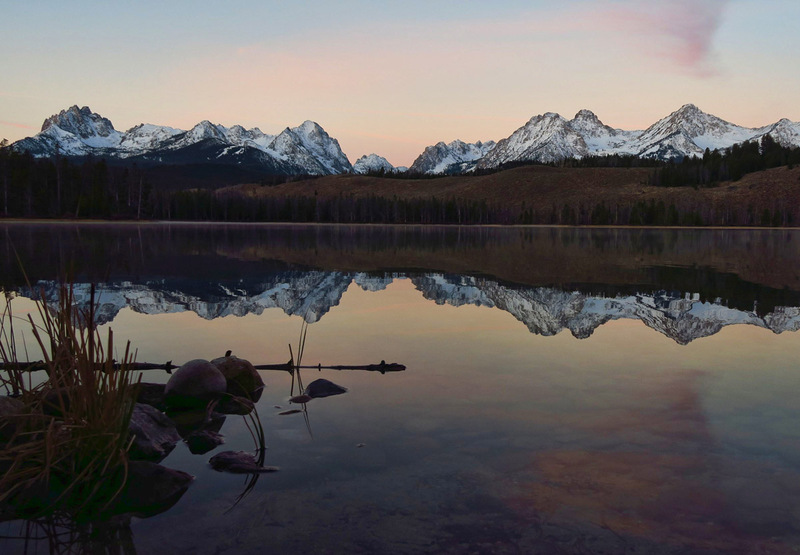 Imagine having a place like Little Redfish Lake…or Payette Lake in McCall…or Kirkham Hot Springs…or Heaven’s Gate Overlook all to yourself. Many of my friends have asked “Isn’t it a little late in the year for Idaho?” Well, yes. But it has netted experiences I wouldn’t trade, and hope to never forget. 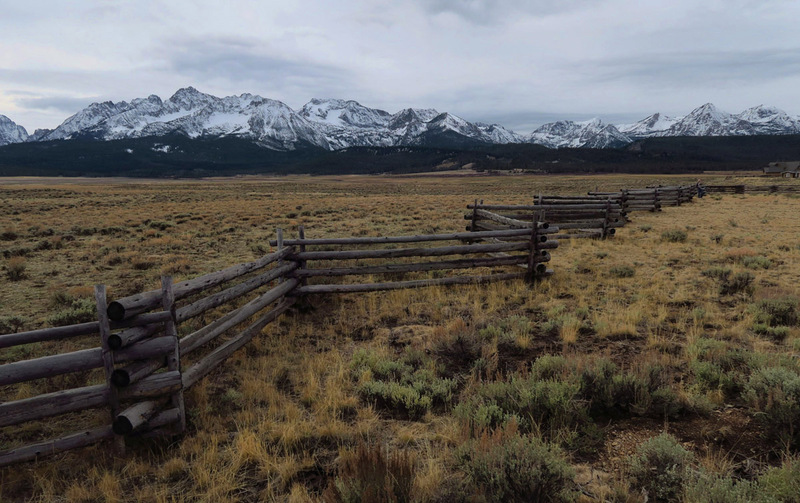 Still, the drive out of the Sawtooth National Recreation Area is gorgeous. 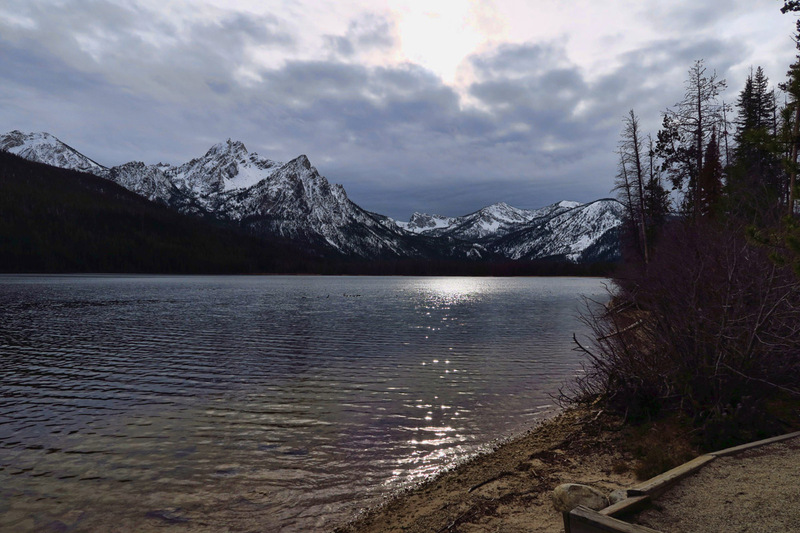 This entry was posted in Idaho and tagged Little Redfish Lake, Redfish Lake, Sawtooth Mountains, Stanley, Stanley Lake by Suzanne. Bookmark the permalink. Wow, just wow! The alpenglow on those mountains is even more amazing with the snow. Gorgeous pics from a gorgeous place! Thanks to the “answers to the homework,” my friend! Totally agree, gorgeous pics, gorgeous place! We much prefer hitting area during the off season versus the peak travel time. 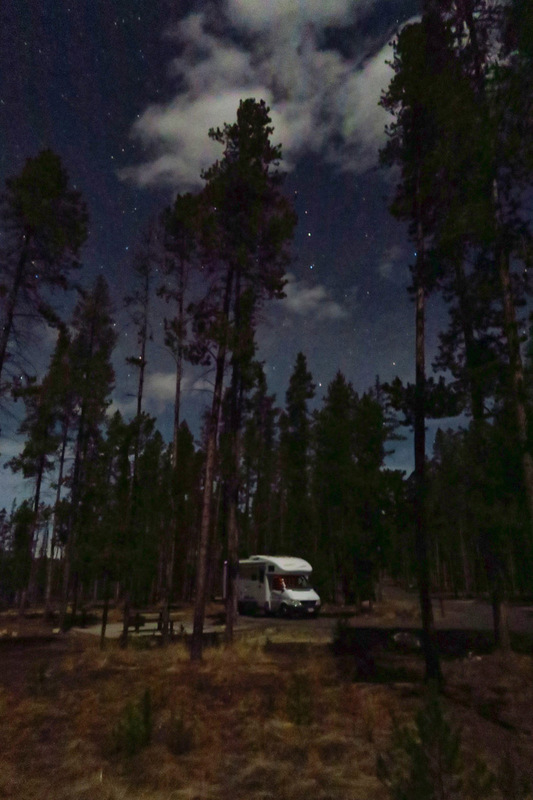 Vacant campgrounds, no screaming kids, quiet chilly nights, you just cannot beat it! 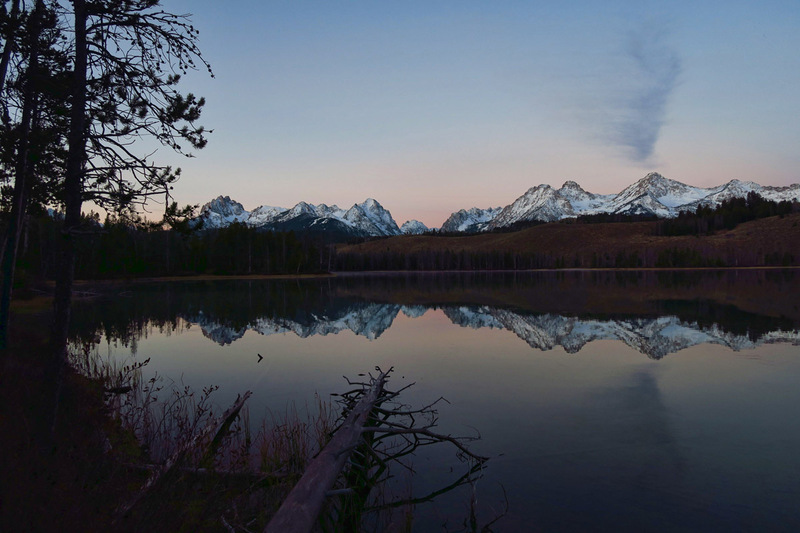 Awesome pictures of the mountain ranges and of the night shots are incredible. Great job! 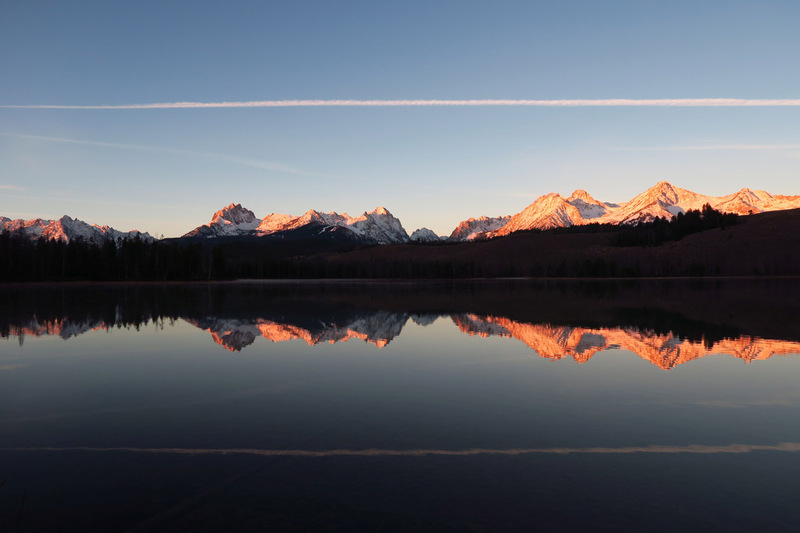 Your photographs of the sunrise over the Sawtooths with the mirror of the lake are amazing!!!!! You, Nina and Becky of IO (who uses only her phone) are my favorite blogging photographers. Keep it up as I am vicariously traveling through your journal. Okay, Judie . . . exhale! It has been 18 years since we were there, but were not fortunate enough to have seen what you have shown here. I’m never clear about location, but we were somewhere not far from the Iron Creek area, which DH has designated as the drop off point for his ashes. This has been on his mind and tongue ever since we were there, and you have definitely brought it back to life for us. As I was scrolling down through your pictures, I found myself catching my breath as the beautiful early morning shots showed up. Beautiful! 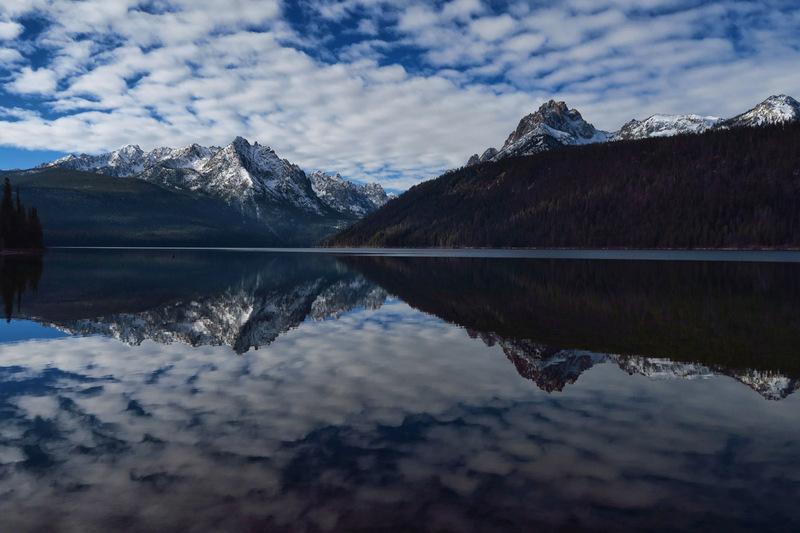 Amazing reflections! 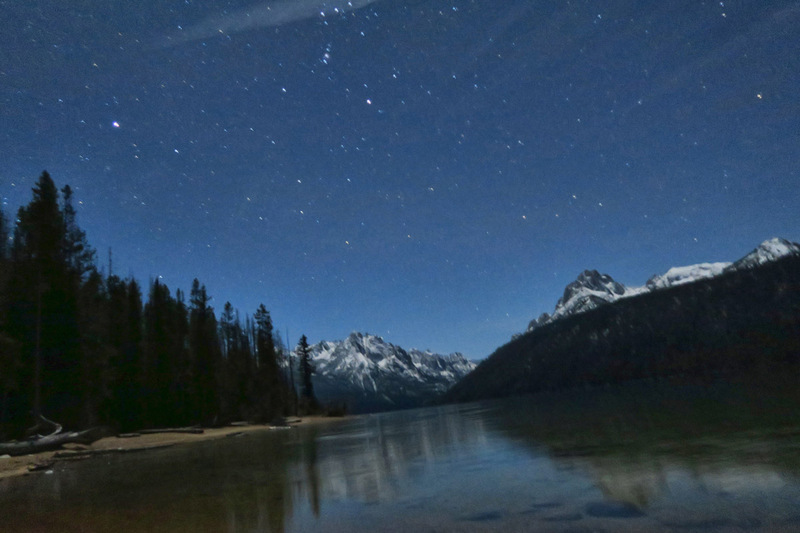 you caught Orion in your awesome star photo. Beautiful. 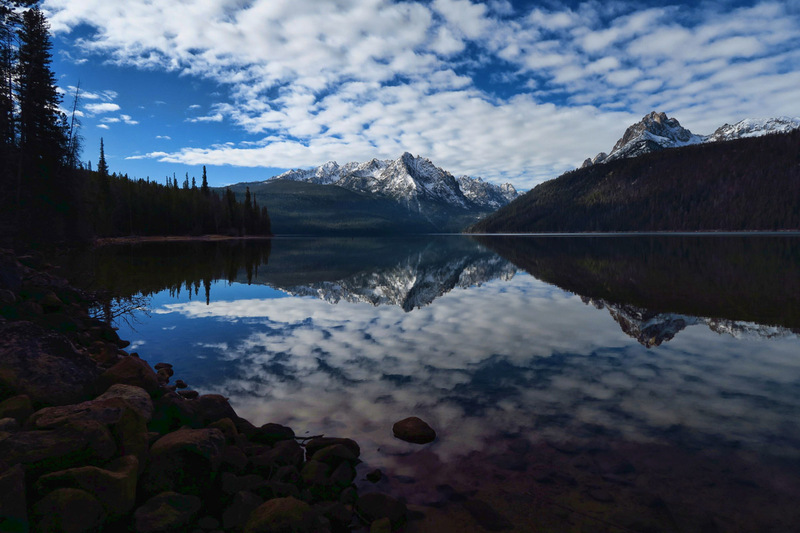 Who knew that Idaho is such a gem? What an exquisite morning! I’d take gorgeous solitude over ease any day. Oh, my goodness! What fabulous photos you took. It seems like the best time to enjoy these views. Totally WOW!! This was definitely worth getting out of your two down comforters to witness. Absolute perfection! I could look at the beautiful reflections over and over. So pretty, calming, and very still:) But I must say, I did really love the night sky. Very cool, clear dipper!! How sweet to have all this to yourselves! Lucky you two:) Bloggers have the best information! Yay, for Nina!! WOW! Just beautiful. I am stunned at how beautiful it is there. Stunning shots, all of them. The water looks like a well-waxed dance floor 🙂 You captured Orion’s Belt in your night shot, my very favorite. Love the off season for quiet nights and less crowded days. OK, that’s way too cold for me but you did it right. Plus Nina’s photo advice took you to the perfect place at the perfect time. Absolutely stunning! Oh my! These photos are off the charts! I love how you captured the stars, too! I’ve always loved the stars…..
A horizontal Rorschach test! And my feelings flow with delightful appreciation…the glowing mountain and starry, starry night photos are the absolute bomb! And your sweet cap is one of my favs from Thoreau…how fortunate (or better yet…intrepid) you are to be able to view the glories of our country on your velvet cushion (in Winnie) with solitude. You captured some amazing shots Suzanne! 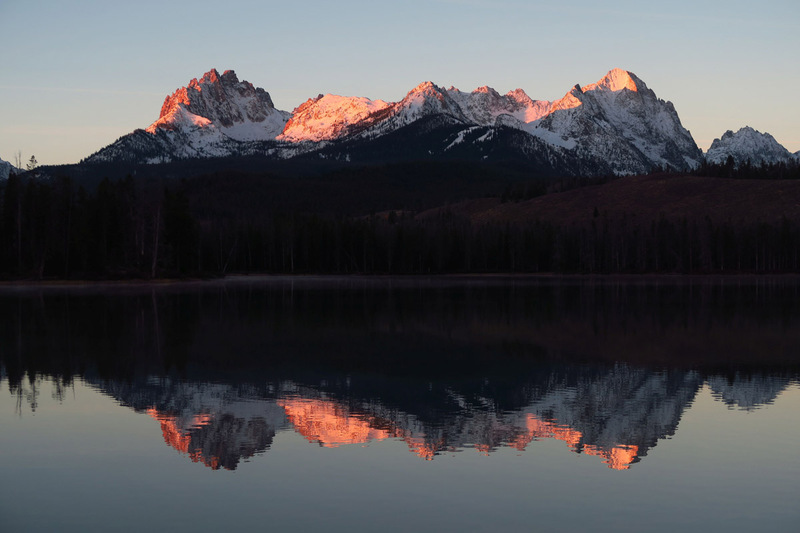 That alpenglow against snow-capped mountains is pretty special. 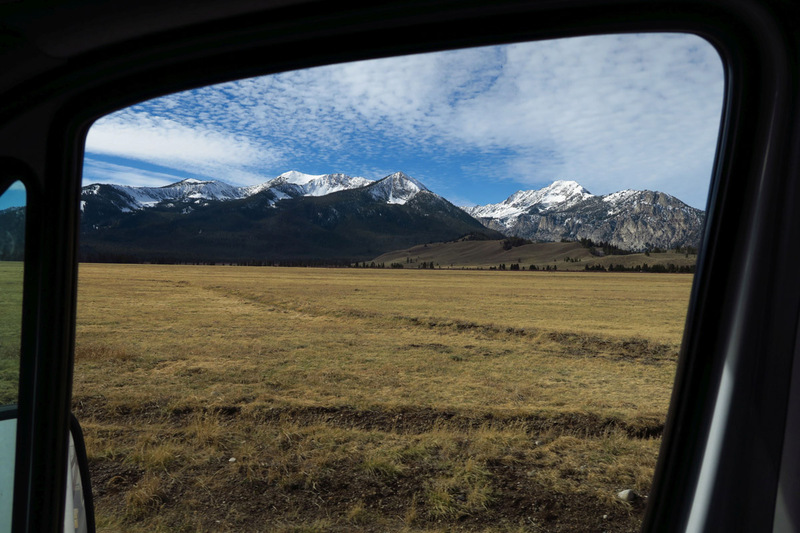 Thank you for sharing your adventures, these pictures are absolutely beautiful. I’m too young for this kind of adventuring….it’s nice to dream about it though…like you, the solitude would be my preference too. Thanks for the comment, Lisa. I am curious, though…what is “too young?” My only regret in life is that I didn’t do more adventuring when I was young. I always found it hard to leave Idaho, and I’m with you. I’d rather be in isolated places. I enjoyed Colorado, but it seems to me that in the past ten years it’s getting almost to the point of being “overcrowded”. 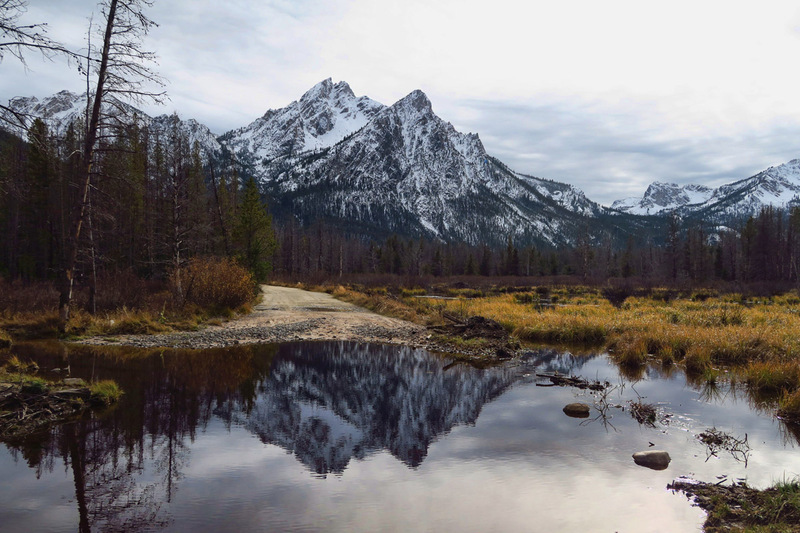 There’s a beauty that Idaho has that isn’t found anywhere else in the lower 48. Then again…there’s always Oregon. 🙂 (also getting crowded). I can remember being able to pull into a campground on the coast without reservations. No more. Love your pictures. I got good ones of Redfish of Stanley Lakes, too. Unfortunately, the really good ones aren’t digital. Once, many years ago we were on a dirt road headed for a lake. We had stopped just to enjoy the incredible scenery when up over a rise came a beautiful, huge silver wolf. He stopped and looked at us for a few seconds, then off he went. Magnificent creature. 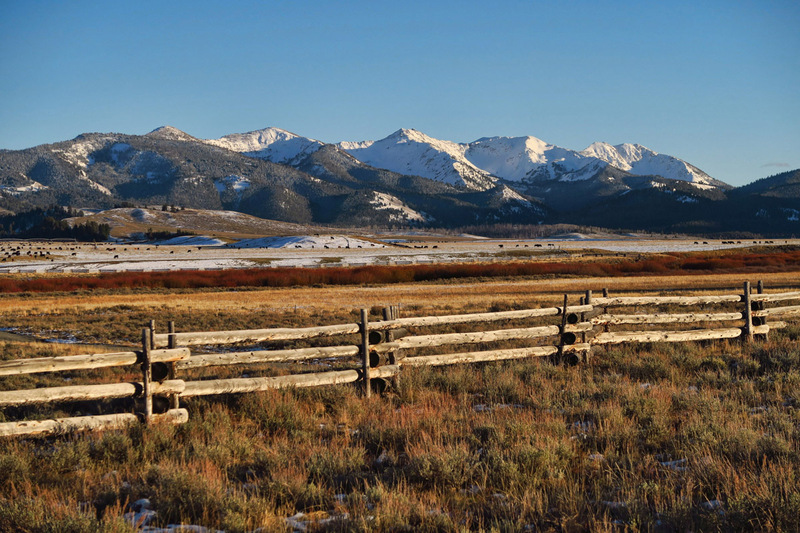 The ranchers, at the time, were not happy having them reintroduced and were shooting and poisoning them. One year we couldn’t let our dogs swim in the lakes because poison bait had been put out for the wolves. I hope that has changed. I understand that putting a Llama in with a herd of sheep will keep them away. Of course the herding dogs and Great Pyranees dogs help, but the ranchers, at that time, were only interested in getting rid of the wolf packs. There’s no end to great Thoreau quotes, is there? Lovely glow. I’ve been saving up your posts to catch up during this quiet holiday time (I’m working on two projects for pay, so portioning my relax time is necessary darn it). I intended to read the thru then comment, but holy moly, this post took away my breath. Wishing you the best of the season, can’t wait to catch up with where you are now.